First things first, just because the word “nut” is in their name doesn’t make them nuts. Peanuts are actually legumes! These tasty and popular treats grow underground and not on trees like real nuts such as chestnuts, hazelnuts, and acorns. Peanuts are edible seeds inside pods and are part of the Leguminosae family along with soybeans, chickpeas, peas, clover, licorice, and lentils. But for the sake of utter confusion, total chaos, and meltdowns around the world, let's just call them nuts. Many people are surprised to learn that peanuts grow beneath the soil and do not grow on trees like pecans or walnuts. Across the USA Peanut Belt, peanuts are planted after the last frost in April through May, when soil temperatures reach 65°—70°F. 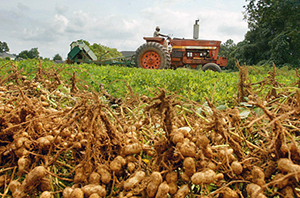 Farmers plant specially grown peanut kernels from the previous year’s crop about two inches deep, approximately one to two inches apart in rows. Pre-planting tillage ensures a rich, well-prepared seedbed. For a good crop, 140 to 150 frost-free days are required. Peanuts are a great source of protein. They also contain other healthy nutrients, minerals, antioxidants, and vitamins. The amino acids in the protein are needed for growth and development. 2. PEANUT BUTTER IS A BRILLIANT INVENTION. So who first thought of turning these tasty little legumes into a paste in the first place? Researchers believe the ancient Aztecs started mashing up peanuts hundreds of years ago. A more modern version began to surface in the 1890s. 3. THERE ARE OVER 500 PEANUTS IN EVERY JAR OF PEANUT BUTTER. 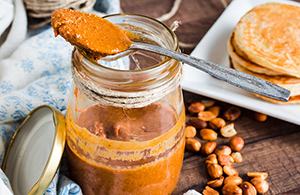 It takes approximately 540 peanuts to make one 12-ounce jar of peanut butter. If you are good at math you can figure out that’s about 45 peanuts in every ounce of peanut butter. there are four basic market types: Runner, Virginia, Spanish and Valencia. Each of the peanut types is distinctive in size, flavor, and nutritional composition. Within each four basic types of peanuts, there are several "varieties" for seed and production purposes. Each variety contains distinct characteristics which allows a producer to select the peanut that is best suited for its region and market. 5. SOMEONE IS GETTING RICH OFF OF PEANUTS. In the United States, one of the world’s leading peanut exporters, peanuts are the 18th most valuable crop. The average yearly export is between 200,000 and 250,000 metric tons! 6. PEANUT BUTTER IS ONLY PEANUT BUTTER IF PEANUTS MAKE UP 90 PERCENT OF ITS RECIPE. These days there are so many brands of peanut butter to choose from, it can be hard to pick a favorite. But to actually be called “peanut butter,” the jar must contain 90 percent peanuts. This applies to traditional and natural peanut butter. The other ingredients in some jars may include oil, sugar or salt. 7. SOME PEOPLE MAKE A PRACTICE OUT OF THROWING PEANUTS. According to Guinness World Records, Colin Jackson holds the record for throwing a peanut the farthest—a total of 37.92 meters (or 124 feet, four inches). Which is hardly surprising considering this U.K. athlete is a former world champion hurdler, which means he’s had lots of practice breaking records. 8. PEANUT SHELLS HAVE MULTIPLE USES. Leftover peanut shells can be used to make kitty litter, kindling, fireplace logs, or compost! If you use them as packing material, you are even helping out the environment as they are eco-friendly! Boiled peanuts are considered a delicacy in the peanut growing areas of the South. Freshly harvested peanuts are boiled in a brine until they are of a soft bean-like texture. Two peanut farmers have been elected president of the USA – Virginia's Thomas Jefferson and Georgia's Jimmy Carter.